That’s the best reply that I’ve got. But when they ask me why Hamlet is my favourite Shakespeare play, I can’t seem to answer. Perhaps it’s because it feels the most realistic. Most of Shakespeare’s plays seem to have that unnecessary death and silliness. Like, ‘I heard a rumour about you and before I work out if it’s true, I’m going to kill you’ or ‘I’m sad that you’re dead so I’ll die too, even though I haven’t double checked that you’re dead yet’. 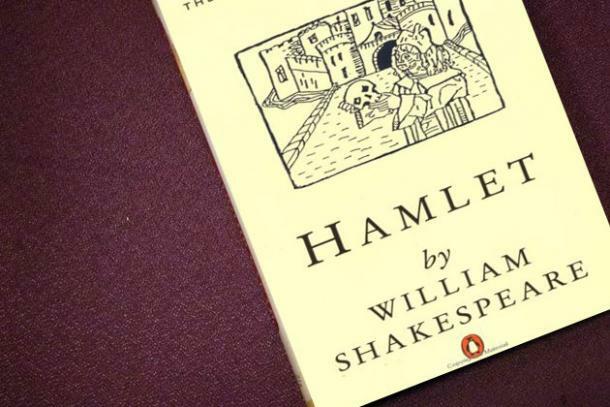 Hamlet takes place after Prince Hamlet’s father, the King, has been murdered by Hamlet’s Uncle Claudius. And now, Uncle Claudius is married to Hamlet’s mother. Hamlet can’t quite move on from this, and plots revenge. But, he’s a procrastinator, and can never quite do it. He almost does it, but then kills someone else instead, and then he puts on a play about the murder so that he can judge Claudius’ reaction to make sure that he is 100% guilty. And then he tries to stab him, but stops himself, because he doesn’t want Claudius to go to heaven. It’s take quite a while for Hamlet to do what he set out to do. And, many people die in the process. But, it wouldn’t be a Shakespeare play without death. The play introduces themes of supernatural, god, religion, madness, and identity (my personal favourite) and is a popular choice for Grade 12 English assignments. So, naturally, teenagers are bound to hate it if they’re forced to read it. But, I was forced to read it, and I’m glad I was.